The Bolshoi simulation is the most accurate cosmological simulation of the evolution of the large-scale structure of the universe. Larger simulations, including the BigBolshoi and Multidark, run at a volume 64 times bigger than Bolshoi and have just been publicly made available to astronomers and astrophysicists. The Bolshoi simulation used data from the Wilkinson Microwave Anisotropy Probe that measured tiny spatial variations in the cosmic microwave background radiation, giving a glimpse of the distribution of matter and energy at an earlier epoch of the visible universe. The Bolshoi simulation is a cube roughly 1 billion light-years on each side. The luminous part of a large galaxy might be about 100,000 light-years, and the diameter of the observable universe is about 90 billion light-years. The volume of the simulation is large enough to contain millions of galaxies, but still only represents a tiny part of the visible universe. The algorithm that runs the Bolshoi simulation was derived from one that was developed by Andrey V. Kratsov of the University of Chicago. It starts by dividing a cubical simulation into a grid of smaller cubical cells. The splitting continues until the number of particles in a cell falls beneath a certain threshold. Each side of the smallest cell is about 4,000 light-years and in total, the level-o mesh has about 16.8 million cells. The Bolshoi cube has 8,589,934,592 identical particles, each of which represents about 200 million solar masses. 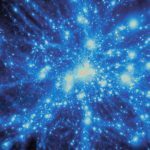 Since the quantum mass is so large, there’s no point in trying to distinguish between baryonic and dark matter. 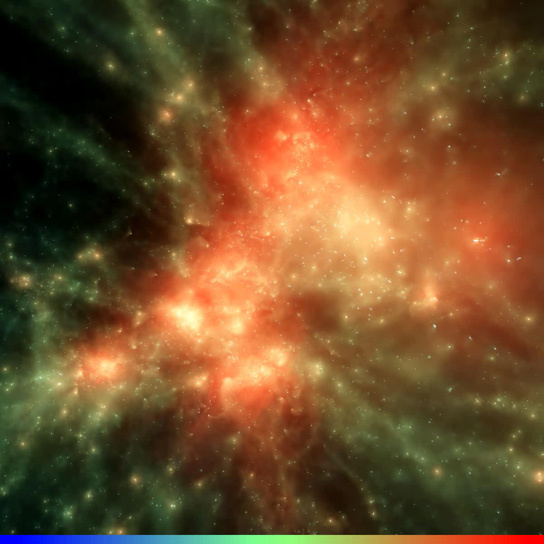 All of the particles in the simulation are dark matter. 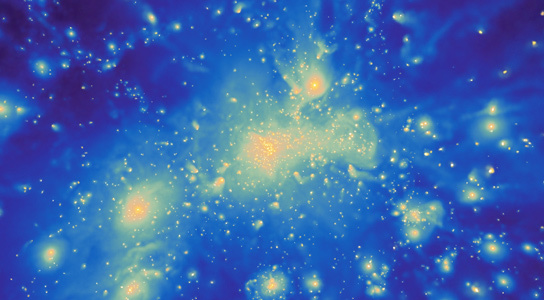 The primary structures which are formed as the universe first evolved are the dark-matter halos in which galaxies are embedded, but the galaxies themselves are not explicitly represented. In the beginning, the 8 billion particles were almost uniformly distributed in the cube. This was the state of the universe post-inflation, when the cosmic background radiation was first emitted. The simulation begins with a universe that is about 23 million years old and slowly progresses to its present state, some 400,000 time steps later. The entire simulation was run on NASA’s supercomputer Pleiades, which is currently ranked 7th in the listings of the top 500 supercomputers worldwide, at the Ames Research Center in California. Bolshoi used 13,824 processor cores and 13 TB of memory. The data generated by the simulations include snapshots, catalogs of halos, and merger trees, which traced the provenance of halos. At the end of the simulation run, there were about 10 million halos left, ranging from the size of a small galaxy to a large cluster of galaxies. Further study could indicate the location and presence of satellite galaxies. The Milky Way has only two prominent satellite galaxies, the Large and Small Magellanic Clouds of the Southern Hemisphere. A study of the Bolshoi data might yield the probability of more of such galaxies. 2 Comments on "The Bolshoi Simulation: Boxing the Universe"
From the instant of the Big-Bang until now is about 14-billion years. Light from the Big-Bang would have travelled about 14-billion light years during that time. Doesn’t that mean that the diameter of the universe can not be any bigger than 28-billion light years? And, the matter expelled from the Big-Band probably would not have been travelling at the speed of light. Therefore, the diameter of the observable universe would be far less than 28-billion light years. Why is my analysis so different from that presented in this article? You’re failing to take into account the fact that the expansion of the universe is the expansion of space not the expansion of matter in space and so isn’t subject to any speed of light restriction. That space itself expands is a deeply counterintuitive idea but one that is fundamental to any understanding of cosmology.